For the first time in Earth’s history, our planet is experiencing a confluence of rapidly accelerating changes prompted by one species: humans. Climate change is only the most visible of the modifications we’ve made—up until this point, inadvertently—to the planet. Yet, without minimizing the challenges of the next century, David Grinspoon suggests that our present moment is not only one of peril, but also great potential, especially when viewed from a 10,000-year perspective. Although our current behavior threatens not only our own future but that of countless other creatures, our species has surmounted the threat of extinction before, thanks to our innate ingenuity and ability to adapt. Our challenge now is to awaken to our role as a force of planetary change, and to grow into this task. We must become graceful planetary engineers, conscious shapers of our environment and caretakers of Earth’s biosphere. This is a perspective that begs us to ask not just what future do we want to avoid, but what do we seek to build? What kind of world do we want? Are humans the worst thing or the best thing to ever happen to our planet? Today we stand at a pivotal juncture, and the answer will depend on the choices we make. In his wonderful writing style, Dr. Grinspoon spells it out: A single species is inducing more profound changes to our planet than any other organism in geologic history. It’s us. If you have family and friends here on Earth, read this book. The Earth is in our hands. Grinspoon’s writing is clear, informal and funny. He is clearly a book-lover as well as a fan of the cosmos, and he has mined vintage popular-science books as well as science fiction for exciting ideas and key quotes. The result can feel like a pub conversation with a well-read, quick mind. …the vision of taking responsibility for Earth in a joyous and optimistic way is striking. Earth in Human Hands is a page-turning masterpiece of speculative nonfiction that will keep new and veteran science aficionados spellbound for hours at a time. It is quite simply the kind of book that can change a young reader’s life, or inspire parents and teachers to do the same. …a delightful, flowing feast of science and commentary.If Carl Sagan were alive today, and had available to him all the science done since he left us, this is the book he would write. It does not preach, but it does not spare. It will instill respect for our past, concern for humanity’s present and presence, and leave behind both critical and optimistic views of our many possible futures. 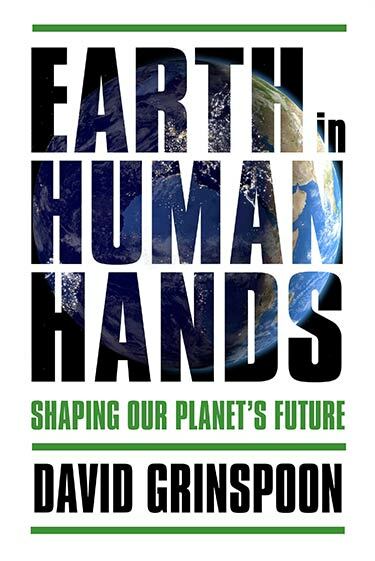 David Grinspoon’s books are always high-spirited, insightful, elegantly-written, and full of fascinations, but EARTH IN HUMAN HANDS is especially so, because he focuses on our home planet . . . I’m sure readers will love voyaging through the cosmos with him again, as I do. Entertaining and insightful . . . takes us through a delightful intellectual romp across the universe, through our solar system, witnessing Earth’s evolution over geologic time . . . I strongly recommend this book to folks who are scientifically curious, and to those who want to hear a different take on our current environmental challenges. You won’t be disappointed. In a moving, personal journey, Grinspoon takes the reader from molten, planetary origins, past current crises like climate change, toward a destiny that our children may yet forge, standing on our shoulders. Grinspoon is a gifted storyteller and his narrative is the rare confluence of authoritative and thought-provoking science and rollicking fun. EARTH IN HUMAN HANDS is a must read for anyone interested in evolution, planetary science, the crisis of the environment, and human survival. In our hyper-technical world, we need science communicators like Grinspoon who can translate their expertise into accessible explanations and interesting stories. …this book is timely not just for the planet’s environment but for the current political one. …This is one of the great strengths of “Earth in Human Hands”: Grinspoon’s ability to describe and explain momentous Earth and space events and discoveries, and then connect to their cultural and social influence; science as part of everyday life and our cultural history, not separate from it. …makes a vital contribution to one of the most important concerns of our time. A beautiful and detailed overview of the ways we must change our thinking if we want to truly understand the transformation in our midst. Profoundly informative, highly entertaining, and surprisingly filled with interesting tidbits as a memoir… This is a book that any thinking person will have been glad to read. One could hardly ask for more from a well executed book on science. Named a “Best Science Book of 2016” by NPR’s Science Friday.